Dinsoft has now 785 inhabitants. It looks like the people don't like to live here and move to the neighbor cities. The transport from Dinsoft to and from these cities is very good. There are several connections with fast trains. This year, 2000, we will get some new and very fast trains. We will wait or them before we replace any existing old train. On March 1 we got the message that we can buy new trains. They are very fast, 305 km/h. It is a monorail construction that means that they cannot run on our existing rails. or the new monorail type. For new constructions the monorail will be used. A good place to start is the railroad from Saston Mines to Betown Power Station. Here are now two trains running from almost 17 years old. They need almost to be replaced. Now we can also make a new tunnel, a bit lower in the mountain. This will increase the speed of the train. It costs over 1.3 million dollars. Also the running cost is a bit more. However, the earnings will be much higher, the train is faster; the coal car can contains 35 tons, instead of 30 for the old ones. At June 17 the new train is running. The July 4 it arrives at Betown Power Station. It earns almost $150,000 Our first fast monorail is ready. Ledinghattan is a small village in the mountain, chosen by us to develop. But since our last visit there is no improvement. They have still only 64 inhabitants. On August 12, we spend a few million dollars for some new buildings. The station accepts only passengers, no mail no food. September we got a message about doubling the production of the Frondhead Farm. It was 160 tons and it will become 320 tons. The transport rating from that farm are already low, about 35 %. November 17 the job at Paninghall is done, they have a new station. We just started with a new farm station when we got a message about a landed UFO. Let's have a look there to see what happens. From an unknown source, we see a strange model airplane. It looks like a military model. After some time it arrives at the UFO location. There is no try to communicate, just a big bomb is dropped to destroy the UFO. We are lucky, our train has no damage at all. We have only to repair the rails. The years before we had a lot of growth. Every year an increase in earnings. Last year we had only a small increase. This is because we did not do any expansion, we replaced only some old, two rails by the new monorail. On June 14 the monorail between the station at Frondhead Farm and Tindhall Woods is in operation. The transport service rating is very low, only 19%. This is due too the fact that there for some time were no trains at all. It will now improve rapidly with the new and fast monorail trains. Now we must replace also all the other rails to and from Tindhall Woods rail station. July 17 the second monorail is to Tindhall Woods is ready. it goes to Brubourne. The trains transports passengers, mail and food. November 7 the monorail from Pennville farm to Tindhall Woods is also in operation. At the moment there are two trains, instead of the four which we had before. Due to the higher speed and better loading capabilities, this should be sufficient. Now the new monorail trains start to make money. The income increase was again about one million dollars. Also our Bank Balance is increasing. Now we earn more then we can spend on construction and new trains. Begin of March we found a problem with train 3. Just on the moment that the new monorail depot was built, some stupid people from Carfingly made a new road. The connection rails between the depot and the rails could not be built. We had first to remove the road and the make the depot to rail connection. Now it is good. Our small holiday village in the mountains did grow, but not yet accept any mail. Begin of the year we constructed again some buildings and now, March 11 we got the message that Ledinghattan now accepts mail. They have now a population of 267. 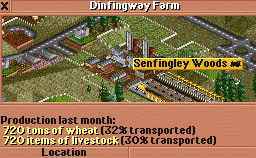 The next step in replacing the old rails with the monorail is from Dinfingway Farm Starfingfield Food Processing Plant. This plant has two station, one is already replaced, new we go to do the other one. November 26 the job is done. A new wheat train, a new Live-Stock train and a passenger + food train. A separate food train goes direct to Tindhall station. Just before the end of December we changed the railroad from Senfingly to Slunningpool. Senfingly has still a three-platform station, but now only one platform is used for the passenger and mail train to Slunningpool. There are a terrible lot of passengers waiting on the station of Senfingly. Whooow, the new trains did do a very good job, over 20 million dollars. However, don't forget the inflation: a dollar from today is less worth then one from 20 years ago. During the time we were working on the construction of the new monorails, we got a lot of messages about "trains getting old". They have all to be replaced by the new monorail types. That means that also the rails itself and the stations must be replaced. We will continue with all the trains from and to Dinsoft where we have our office. February 14 we started with our work around Dinsoft. First all trains returned to their depots, then new station, the new railroad and finally the new trains. As soon as there is a part ready where a train can start then we put one in operation. End of April we got a subsidy for an already existing train, thanks a lot for this, we always need some extra money. End of October all work at Dinsoft is ready, except the railroad for the transport of the printed goods. For this we have to replace the whole line up to Tenington Woods station. November we got a message about a landed UFO near Tenington Woods. Now we go to do something different then before, we go to place two trains on the UFO position. These trains will protect the rails. December 15, the UFO was destroyed. The trains and rails were still good. Our earnings are still rising. Almost 2 million more then the year before. We spent more then 10 million dollars on construction and new trains. This will remain our highest expense in the future. January 20, Tenington Woods has a new Monorail station. Now we can be sure that the transport rating will increase from 50% to maybe 90%. We can also save money by running only one train. March 18 the first monorail train is loading wood. April 3 it arrives at the Paper Mill. June 16 the new paper train is running. 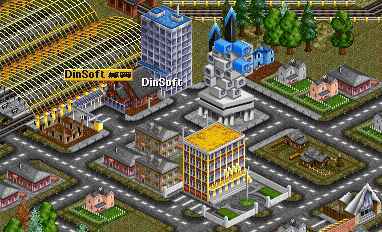 Now we have only to connect the printing factor with the railroad station in Dinsoft. September 5 the goods train arrived at Dinsoft station. We replaced already a lot of trains, but there are still many more trains to be replaced. September 23 Ledinghattan accepts Food and Goods. Now our food train can make some money there and the village can grow a bit. Now we have really to replace some of the very old trains. For example train 16, from Tatfield Central to Nardinghattan Bridge is already 26 years old. The reliability is 0 (zero). End of December, just before Christmas, Tatfield has its first monorail connection. It is from Tatfield Central to Nardinghattan Bridge. The other connection to Tatfield Central will be done next year. We have now so many old trains that our income is going down. It is possible to replace them by the same models, but these models are getting old and there reliability is rapidly decreasing. They have all to be replaced by the Monorails trains. Now Higgings & Co. is founded, they try to get a subsidy for a gold transport from Kendhattan Gold Mine to the bank in Gadtown. They won't succeed, it is very difficult to find a place on the river to build a bridge and when they are ready with the rail road, they have no more money to buy a train. February 20 the new monorail from Tatfield to Hunley Market is finished and the train is in operation. At this moment the transport ratings in Hunley Market are very bad, 18%. This will improve rapidly with the new train. The train is really full with passengers and mail. April 29, new train from Drontburg Central to Kindingstone. June 12, the Gold train from New Pronfingley Woods to Drontburg Central. July 6, the train from Drontburg Central to Parwood. Parwood has now a new two-platform train station. August 23, new train from Parwood to Hunley Market. November 20, new coal train from Overingway Mines to Lendhead Woods. December 25, new train from Dinfingway to Ronwood. A lot of time and money was spent on new monorails and new trains. As a result of that, our income starts to increase. Roughly two million dollar more then the previous year. We will continue with the replacement of rails and trains. August 20, the first new Z1 is running between Tindhall and Bufinghill City. It has a few extra passenger cars and a Mail Van. There are still some subsidy offers. We will try to get the two passengers services. For the subsidy on the passenger service from Bufinghill City to Tronbridge we made a junction between two, already existing lines. The train from Tindhall to Tronbridge is out of service. We have now 59 trains and about 20 of them are still of the old types. It seems that we need a few more years to replace all the old trains by the new monorail system. Well, we have now money enough, let's continue. Where are the rails? At the start of a new year is always a good time to look around on the map, to see if everything goes well. We found a terrible problem. The rails at Tenington Woods were damaged. It is possible caused by the destroying of an UFO. When we are busy with construction and replacing trains, there is not always enough time to follow all the news. We have to repair this immediate. Last year this train made almost a half million dollar, if we don't repair, it will be negative. New Pindhead has connections with two other stations. Now we have to replace these also. We are still very hard working to replace all old trains by the monorail trains. Hopefully it is finished before the first monorails are getting old. Our income is 3 million dollar more than last year and is now over 30 million dollar. Almost all old trains are now replaced. There are three old trains left. Maybe we keep one for our company museum. However, earnings are still very good, so we will continue to do our work. Flondston was still too smal to receive mail so we did a "Found new buildings"
We are continuously receiving a lot of messages. Now one with a new "Superbus" The problem with these messages is, that, if we don't read them we may miss some important information. But, when we read them and look to the details, we may forget what we are doing at that moment and start with something else. It works, April 26, we got the "Flondston accepts mail" message. Very good, on Fennville station there are more then 600 mail bags waiting. Sometimes there comes a suitable offer for a subsidy, like this one from Condinghall to Pennville. The rails were already there, but still the old type. This was replaced by monorail, another new train; and we got on September 15 the subsidy. There are still some old rails connected to new stations. like in Fledingville. Some years ago this line went to Tatfield. Now there is also a gold mine in Fledingville, so we go to re-route this line Nardinghattan Bridge. October 18, the new train left Fledingville. It has passengers cars, a mail van and an Armored Van for gold transport. December 2 a new train from Hunningwell to Sentwood. Hunningwell is a village in the mountains, just below the eternal snow. WWW Transport has now 61 trains and 8 road vehicles. Our Operating Profit Chart looks very good. The company value is also very good. In the Company League Table we are on the top as "Chairman" The one below us is "Traffic manager". The rest is only "Engineer"